Day Two of the Biomimicry Conference continued this theme with an exciting futuristic presentation by one of Fast Company's 100 Most creative People, MIT Media Lab Director Neri Oxman. Oxman is on the forefront of the 3D Printing revolution, looking to create "smart" materials that act as natural ones do. In Nature, said Oxman, bones thicken in response to force, leaves grow toward light, and trees branches are shaped by wind. Why not a wrist splint that adapts to where you feel pain? Why not a lounge chair that shapes to your body and adjusts to your weight? Nature uses a stripped down palette of materials, which can dramatically change their properties with simple structural adjustments. Skin on your face, for instance, is not the same as that on the soles of your feet. What about printing with fiber optics to make light-production intrinsic to an object? Making a pair of glasses as a single object with variable transparency, rather than a separate frame and lenses made from different materials. But Oxman's team at Mediated Matter found themselves frustrated by the primitive state of our current 3D printing technology. Then, they asked "How would nature design a 3D printer?" and decided to study the "simple rules" used by domestic silk worms to determine where and how to 'print' their silk. 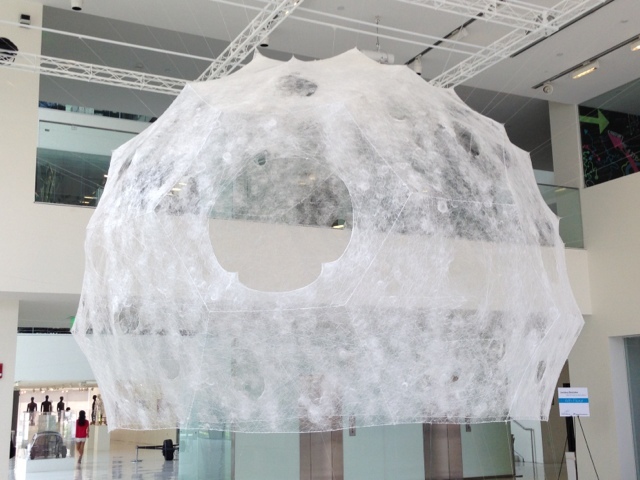 The silkworms act as living 3D printers. The team constructed a Buckminster Fuller-inspired geodesic dome scaffolding, and released 6500 Bombina moryx silkworms. The worms "printed" the beautiful Silk Pavilion now hanging in the MIT Media Lab lobby, with "smart" variations in density and patchiness responding to light and substrate. In essence, the silkworm is a combined biocomputer and freeform printer, programmed by its DNA, and printing with biodegradable silk, produced on-site by simply feeding the silkworms plant material. What does the future hold for this exciting idea? The printing material could be changed through genetic engineering (spiderwebs?) or the "simple rules" themselves (make it differently). Realistically though, that's a hell of a lot of silkworms for a structure about as big as an igloo. Which most likely makes this an art object and a teachable moment, rather than a scalable technology. What can we learn from these and other "living printers," like spiders, mushrooms, or corals? Imagine "growing" elements of your home, lighting, or furniture. Imagine downloading blueprints, possibly genetic, from the internet, and uploading them into printing robots that act like silkworms or other creatures? Of course, visions of a radically different manufacturing future make people a little nervous. What could be the unintended consequences? Genetic engineering in particular puts many people on red alert, and the domestication of other species can be seen as a violation of their sovereignty. What right do we have to breed silkworms to be flightless moths acting as our slaves? To take away their mate choice? These are questions worth considering as we think about what kind of future we would like to have. What would nature do? Janine Benyus stood up to offer her belief that biomimicry in material science should be a "process of learning from other fabricators. If you're wearing cotton, a plant made it for you. If you're wearing wool, a sheep made it for you. It's time for humans to start making our own materials." To read more, look for my article on Triple Pundit, part 3 of a 5 part series about the Conference!